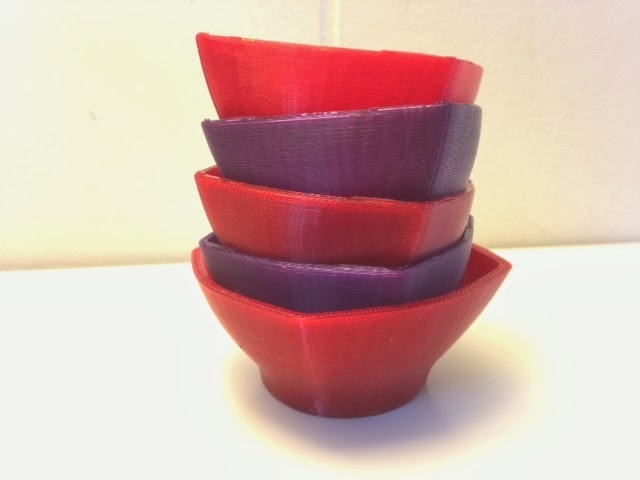 The past week of cleaning and family visits has meant a lot of reprints and Thingiverse designs, and today is no exception: we printed a bunch of bowls from the same model used in Day 64 and Day 65, petergross3's Condiment Bowl from Thingiverse. Settings: Printed small versions at 60% size on .3mm/low with linear fill (see below). The one on the bottom is a little shorter; we cut off the top in Tinkercad to make a wider bowl. Not recommended, as that caused it to lose its nice top lip. Technical notes: To get linear fill we made a custom profile in MakerWare based on "PLA Low" and changed "sparseInfillPattern" to "linear". I'm hoping that in future updates of MakerWare there will be an easy dropdown menu to change the fill pattern.